Last horse drawn wagon ride departs at 5:00 pm. The sleigh rides are by appointment only. Call us at 330-893-4200 during regular business hours to set up your reservations. The Farm will resume regular business hours April 1, 2016. See more The Farm At Walnut Creek videos. 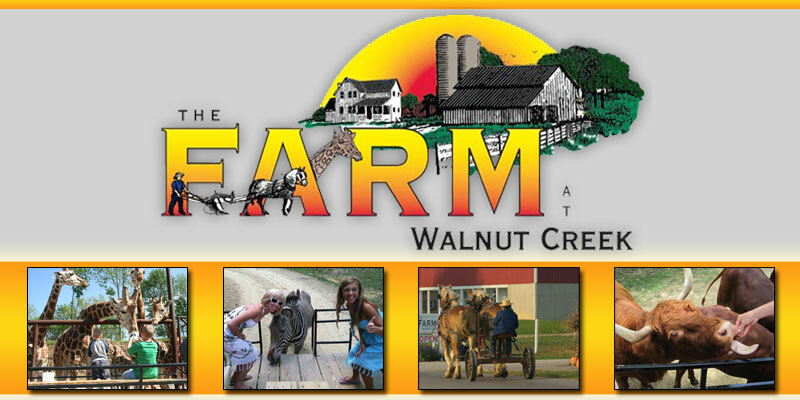 The Farm at Walnut Creek offers a educational experience only available at Walnut Creek Farm in Ohio. Located near the heart of Amish Country in Ohio, The Farm at Walnut Creek hosts over 500 animals, comprised of species from six of the seven continents. Our menagerie includes exotic animals such as giraffes, camels, zebras, and kangaroos along with more common animals like horses, llamas, and deer. Visitors have the opportunity to view and hand-feed the animals from a conventional car or a horse-drawn carriage. You can also visit some of the animals in our petting zoo. We are a working farm and as such, the type of activities visitors may witness during a visit change with the seasons. Depending on the time of year, you may see plowing, thrashing, canning, quilting and more. You can tour our non-electric farm houses, buy produce at our farm stand, and take pictures of all that you see. The Farm is a fun and educational experience for people of all ages. Call us at (330) 893-4200 for more information. We opened our Farm in 2006. We are located at 4147 Co Rd 114, Sugarcreek, OH. See more The Farm At Walnut Creek photos.